One of the best overnighters in the Wilderness, with excellent loop possibilities. This is the northern gateway to Sawed Cabin Lake - a fun off-trail scramble over a high pass to the south. 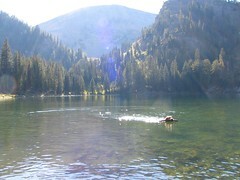 Hike the 5 miles to Johnson Lake. On the far side of the lake, just after the trail goes by some campsites, look for a junction heading south to Pintler Pass. (If you miss this, you are on your way to Rainbow Lake.) The trail climbs the western side of a pretty basin, eventually taking you up and over Pintler Pass, the high point of this hike. You then drop a bit, and the trail flattens out and heads west until it makes a small final climb to first a small pond and finally Oreamnos itself. Oreamnos means mountain goats, and we saw one on the steep wall across the lake right as we arrived. There is one well established, sheltered campsite between the pond and the lake, and there is at least one more along the lake shore. We used a large boulder not far away for our kitchen. From our experience it seems that this lake gets heavy use considering how remote it is. There are routes from the south (Big Hole) that we have not hiked. I recommend Mort Arkava’s excellent Pintler book for more information on all of the Oreamnos routes. When we hiked to Oreamnos, it was part of a 3 day loop - day 2 steep up and over to Sawed Cabin Lake, then a gentle up to connect with the CDT, then headed west toward Hidden Lake (a good part of this is through a recent burn), side trip to Hidden Lake (very nice, big fish, serious fisherman), then west to Kelly Lake where we made camp. We walked over to Ripple for an evening stroll, which is very pretty, then in the morning made our way out via Bitterroot Pass, dropping into Little Johnson Lake, then back down to the Middle Fork / Falls Fork trailhead. From Phillipsburg drive 5 miles south on state highway 1. Turn right onto highway 38. Drive about 6 miles, then turn left onto Moose Lake Road. Drive 15 miles up this good gravel road to the trailhead. You will pass Moose Lake and Project Vote Smart on the way. The trailhead has plenty of parking, horse facilities, and an outhouse.